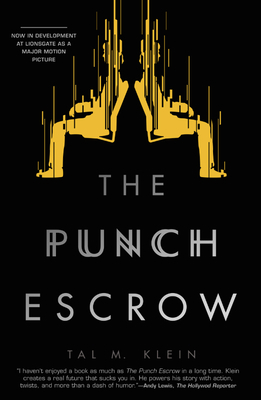 With a cheeky narrator running the show, The Punch Escrow takes place in the year 2146, set to an 80’s soundtrack, displaying a humankind reaping the morally flexible rewards of too much knowledge. Governments are a thing of the past, much of the world now run by a few gigantic corporations. Every single person has their own virtual personal assistant, allowing the wonderful ability to receive 24/7 help while assuring the government can track your every move. Our hero Joel Byram is a slacker in the truest sense of the word. He does the minimum amount of work necessary in order to keep his lifestyle moving and his ambitious, overly-worked wife from leaving him. In order to encourage a constantly increasing Artificial Intelligence knowledge base, people get paid to stump their personal assistants. Every time Joel tricks his – or anyone’s – assistant, he gets paid a small fee and the assistant gains a small piece of knowledge. While his life appears to be puttering toward the end of a marriage that has run its course, Joel is scrambling to figure out how to reverse course. Joel’s wife works in a highly classified capacity for International Transport, the most powerful corporation in the world. International Transport gained its power and position after creating the ability to teletransport humans but, as with any amazing discovery, there are always unintended consequences. When the unintended consequences have a personal impact on Joel, all hell breaks loose. With his debut novel, Tal M. Klein has envisioned a frightening 1984 on steroids that might keep you up at night when you think of the implications. Keep your eye out for the movie-he received a seven digit picture deal prior to publication. Not bad for a first timer.